Donna Wyant Howell. I Was a Slave: a book series based on the compilation of oral histories provided by former slaves c. 1930s. American Legacy Books: 1995, 1999 (and on-going). Eric Foner. Reconstruction: America's Unfinished Revolution 1863-1877. Harper & Row, Publishers, 1988. Morton Keller. 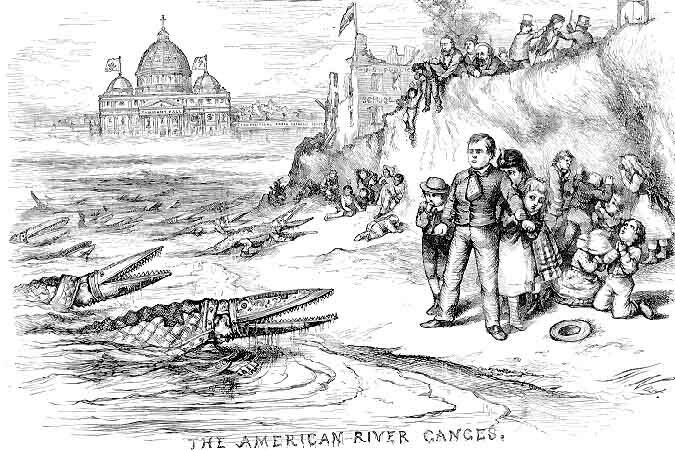 The Art and Politics of Thomas Nast. 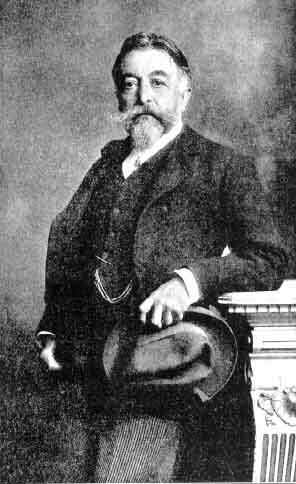 Morton Keller. Affairs of State: Public Life in Late Nineteenth Century America. The Belknap Press of Harvard University, 1977. Albert Bigelow Paine. Thomas Nast: his period and his pictures. New York: The Macmillan Company, 1904. The working life of Thomas Nast [left, in 1895] encompassed virtually all of the last half of the 19th century. Those years represent a watershed in United States political, economic and social history, arguably as revolutionary as any time before or since. What follows is a brief look at Nast's career and the changing times chronicled in his work. His era was complex and contradictory. So was Nast. Influences on Nast's graphics sensibilities were drawn from the earlier satiric art of William Hogarth, James Gillray and Thomas Rowlandson, and French satirist, Charles Philipon. Each of these pioneers of visual caricature broke ground for later artists who, like Nast, also addressed social or political issues. Also inspirational was the work of those closer to Nast's era: in Punch, Sir John Tenniel and John Leech, and French artists Honoré Daumier and Grandville [Jean-Ignace-Isidore Gérard]. Like the French artists, Nast also used criticism to defend his political beliefs and social ideals. 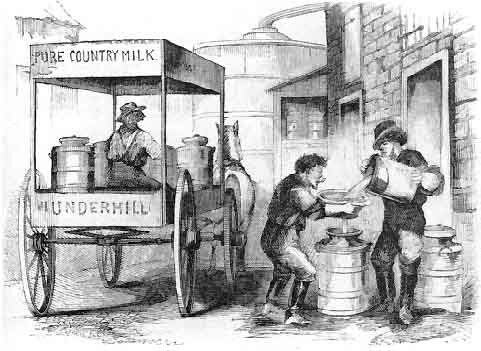 His first work for Harper's Weekly appeared in March, 1859 and concerned scandal in the police department; he also did a series "illustrating the vice and misery of New York tenements," but he had to take his work where he found it, and not all of it was a vehicle for his social conscience. 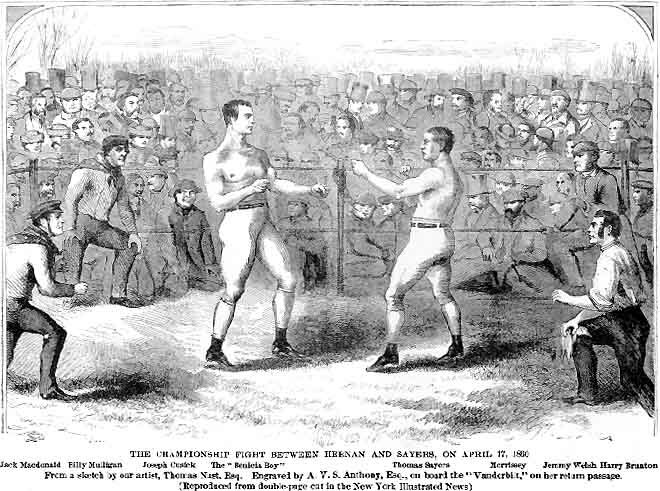 In November 1859, although not yet a staffer at Harper's, but with the hope to become one at some future date, he accepted an assignment for the New York Illustrated News to cover an international bare knuckles boxing match between American champion John Heenan and his British counterpart, Tom Sayers, to be held in England. This 1860 work [left] by Nast shows his ability to render faces in a crowd as distinct, recognizeable, individuals. He would use this technique throughout his career, as an image from 1871 illustrates. After 42 punishing rounds, "it became simply an effort on the part of Sayers to keep alive until the police should come to his rescue," which they did, and the whole thing was declared a draw. This "permitted [Heenan and Sayers] to give exhibitions together, which on the whole were doubtless more profitable than the fight" [Paine]. Reporting on the two roving prizefighters did not satisfy Nast's journalistic ideals. 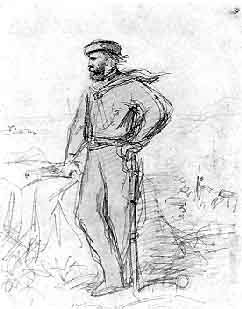 While still on assignment in England, Nast heard how Garibaldi was rallying an army in one "great final attempt for Italian union and freedom...The picturesque, impetuous Garibaldi [right, as sketched by Nast] was just the figure to attract a boy artist, full of romance and military memories" from his childhood in Germany. Nast would travel with Garibaldi's army for almost a year, and return home in early 1861 to find another sort of war. 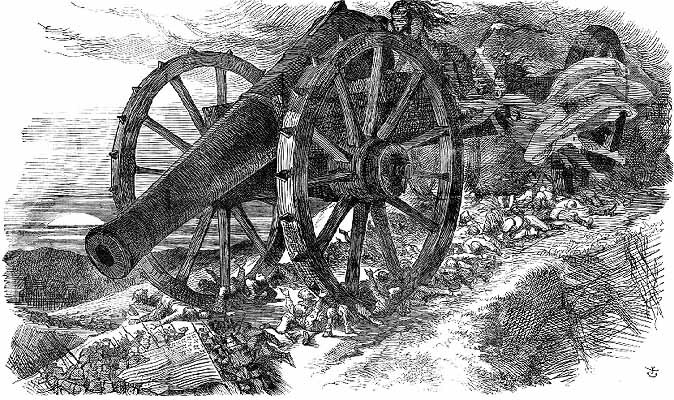 The Civil War (1860-1865) was the defining event for Nast and his generation. His sympathies lay with the Union, specifically with the professedly egalitarian, socially progressive ideology of the left-wing of the Republican coalition, the so-called Radical Republicans. 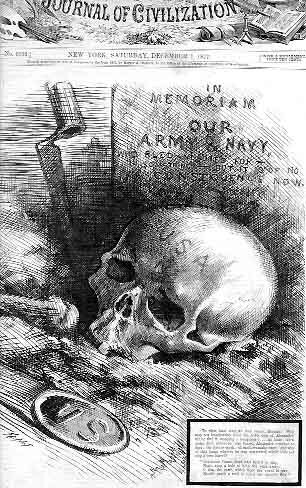 Nast joined the staff of Harper's Weekly in 1862, and became, as Lincoln said near the end of the war, "our best recruiting sergeant...his emblematic cartoons have never failed to arouse enthusiasm and patriotism, and have always seemed to come just when these articles were getting scarce." Although Nast's Civil War images show the desolation of the countryside, mourners and tombstones, cold soldiers standing guard and hungry civilians, the broken body horror of war is not foremost. The cruelty of slave auctions and whipping posts are represented, along with positive visions of a post-war, free black civil society; it is clear that some larger goal, that is, the restoration of the Union, makes all the personal sacrifice and suffering worthwhile. 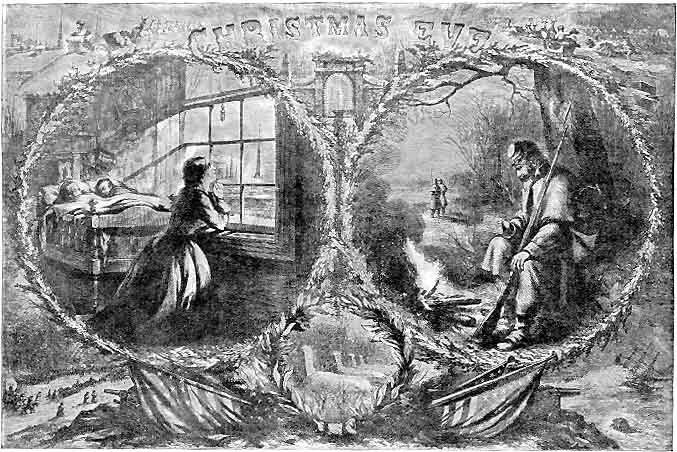 In an 1862 image [left] his contrast of the 'home front' and the 'front line' is unabashedly romantic. For comparison, his war images from the Franco-Prussian and Russian-Turkish conflicts a dozen years or so later are devoid of any justification for war, and Nast now represents only the needless loss and suffering war brings. By 1877, the sacrifice made by Civil War dead is of no consequence, in Nast's words. What made his vision change? The aftermath of the Civil War brought unprecedented social, economic and political realities that conflicted with Nast's ideals -- ideals nurtured in an earlier and far different era. "The war's daily lessons in the value of organization spurred a variety of economic groups to seek ways by which their interests might be better served"[Keller, 1977]. These groups included farmers, labor unions, industrial monopolists, the first national trade associations and what came to be termed political machines. The civil service had mushroomed in size and the power of a centralized national government had never been greater. All these new ways of dealing with the economy and politics were in conflict with Nast's independent, democratic values. 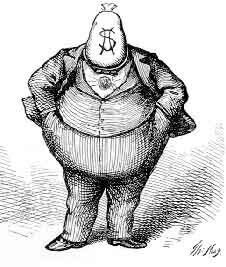 His outrage at the abuses, which had been exacerbated by the organizational shift of power, motivated his most enduring legacy, the series of drawings (1869-71) that toppled the rule of political boss William Marcy Tweed [left, in Nast's inspired caricature] of the New York City Democratic Party machine known as Tammany Hall. 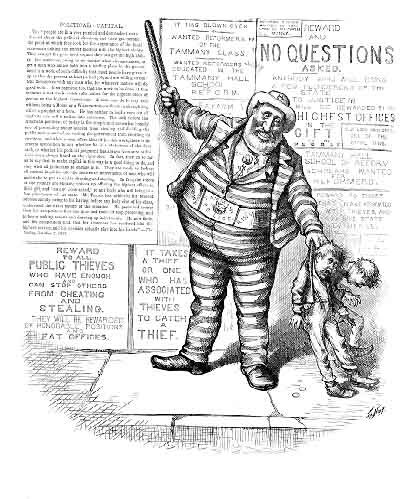 The control of votes and the public purse by an effective political machine, as exemplified by the Tammany crooks, was just one of the post-war changes to which Nast responded. Nast was unable or unwilling to abandon his ideals when faced with the pragmatism and greed of the post-war era. 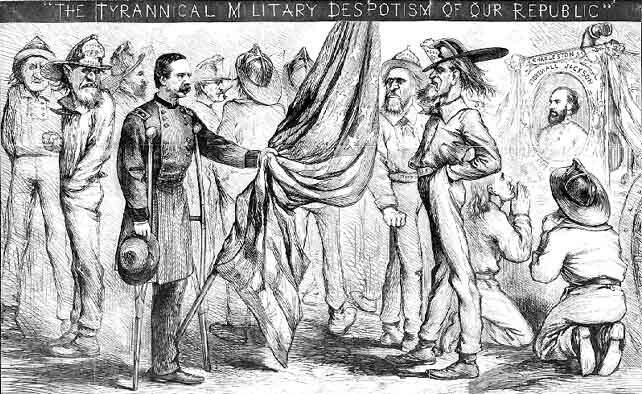 In his Civil War drawings, Nast conveyed both the war's tragedy and a "compensatory sense of purpose, of justification for all the pain and loss." [Keller, 1968]. That justification was the dream of a truely united republic in a land rich with natural resources, and free citizens cooperating in civil discourse to address public needs. However, this optimism, for both the artist and the radically minded Reconstructionists was tested by a severe economic depression, which began in 1873, hit bottom by 1878 and with periodic upturns, dragged on to the century's end. Banks and businesses failed in what were then record numbers; whatever gains the still young trade union movements had been struggling to make with respect to a living wage and an 8 hour day were quickly lost; farm prices that had risen with the war plummeted. Industrial strife, strikes and unemployment were common and at times violent during this period. For all his socially radical, progressive ideas, Nast was a fiscal conservative, more in tune with what he idealized as a partnership between labor and capital. Perhaps at the slower pace of pre-war days, with smaller scale industries, and a smaller population, such mutually respected cooperation might have once been workable; in Nast's mind, this ideal relationship of labor to capital was still an option. In reality, the war had forced the country to turn the corner into modern times. In this respect, Nast remained old-fashioned. His stance against inflation, which he famously symbolized as a rag doll, known as a "rag-baby", and anything other than a hard money gold standard to pay off the national debt was in keeping with his conservative monetary views. 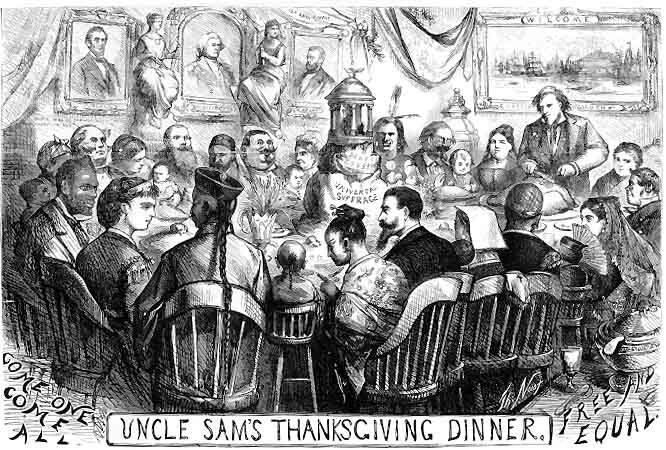 In other respects, he was ahead of his times : living in a culture that all but promulgated ethnic and racial stereotyping, Nast incorporated non-stereotypic depictions of Native Americans and Chinese immigrants in his work, as well as African-Americans, often in connection with and in contrast to the unreconstructed white Southerner. But he was not without bias. 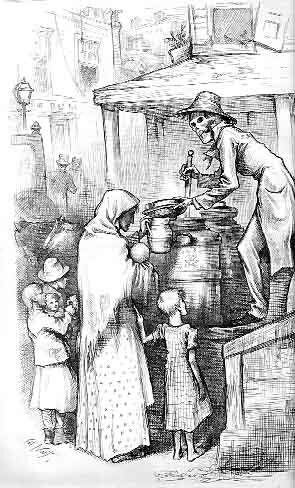 He could draw wickedly cruel stereotypes, and did, of the Irish, who started arriving in increasing numbers about the same time as Nast himself had arrived (from Germany) in the late 1840s. It may be that his irritation was not with the Irish per se, but rather with the Catholic Church, which had grown as the Irish population grew. And his anti-Catholic views seem to stem from his ardent desire to keep church and state, especially state schools, separate. Reconstruction had its supporters in the South as well as its detractors in the North. It was not something people felt neutral about, whatever their perspective, as Nast depicts in an early post-war conflict in Charleston, South Carolina. It was this 'triumph' of the party machine against which Nast railed; his efforts to topple one party machine would be the defining work of his career. Unhappily for his later work, Nast is best remembered for the powerful Tammany Hall series that ran in Harper's Weekly between 1869 and 1871; the series exposed and ridiculed the corruption in New York City and State Democratic Party-controlled politics; the officials of Tammany Hall organized the votes of new immigrants and the dead to stuff ballot boxes, stay in power and raid the treasury at will. Their graft and patronage system was an affront to Nast's idealism and to his egalitarian Radical Republican views. His images skewered the offenders by exposing their criminal greed, and roused public anger at the situation. The series made the artist and the magazine synonymous: it is hard to think of one without the other. 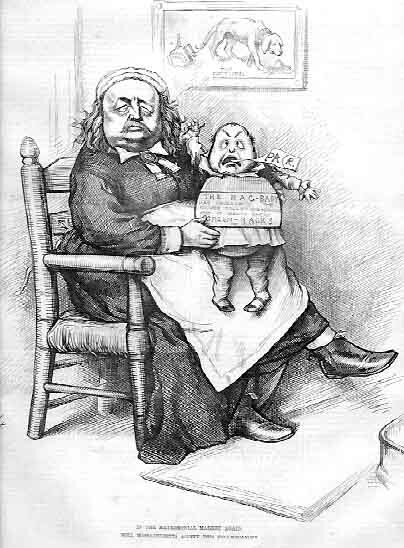 The drawings also convinced voters to reject the Democrats in the November 1871 elections. 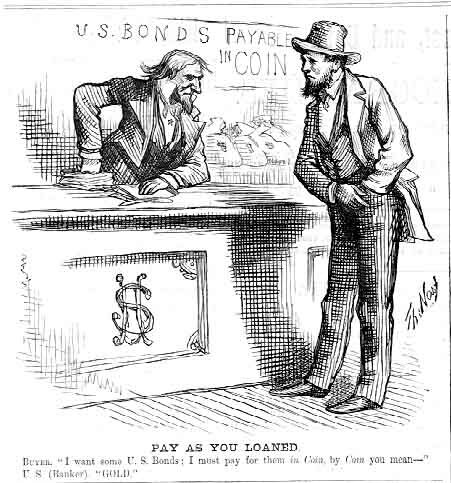 Ultimately, party boss William Marcy Tweed, the central character in Nast's cartoon series, was tried and convicted for stealing millions from the public trust. A brief escape ended in recapture, thanks to one of Nast's cartoons, and Tweed died in jail, in 1878. [For the response of other artists to Tammany Hall, see Judge and examples of the work of Frederick Burr Opper in Puck ]. 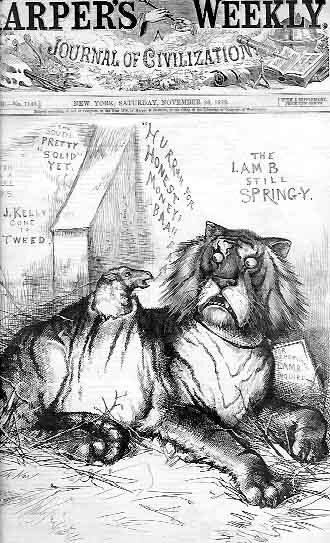 If the series (symbolized by Nast's choice of a tiger to represent the Tammany corruption) marked the high point of Nast's career, these years were also the acme of Nast's own optimism and idealism about his re-united nation, fueled by the victory of the Republican North, the election of U. S. Grant (1868) and the early implementation of Radical Republican plans for the reconstruction of the South. 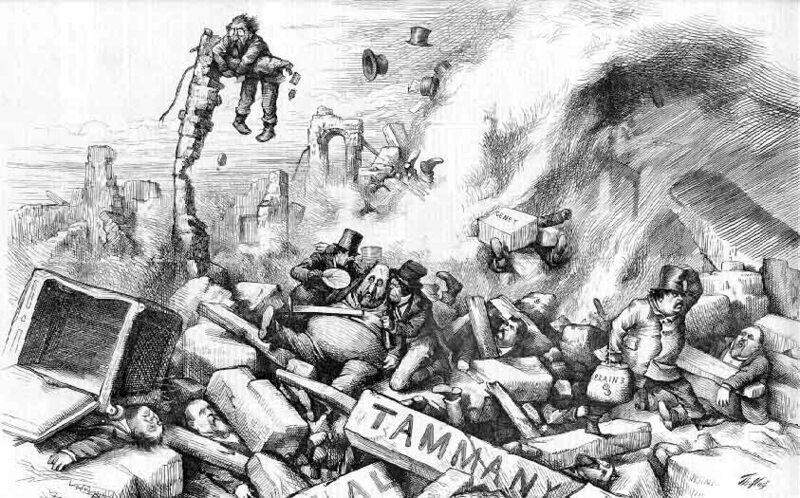 After 1871, Nast finds less and less to differentiate between the political ends and means of Republicans and Democrats; the Tammany Hall patronage system in New York, despite the ousting of Tweed and his cronies by voters in 1871, didn't die out. 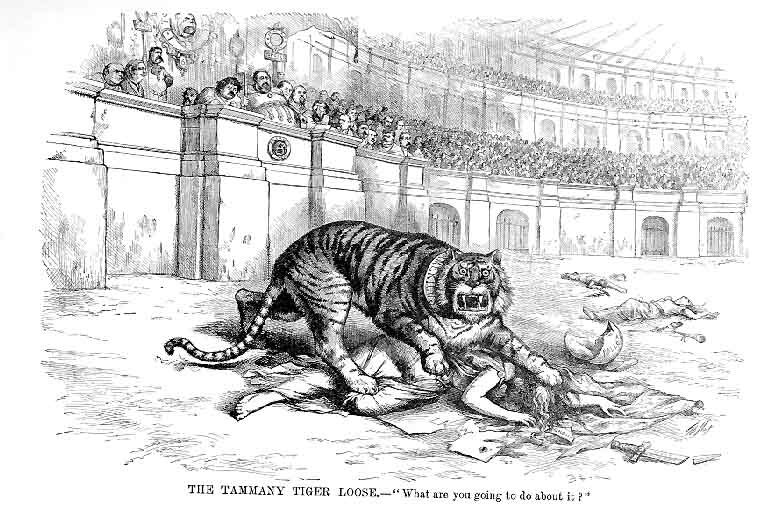 It continued to function as the 'Reformed' Tammany Hall, and Nast continued to use the tiger as its symbol, with a lamb to suggest a reformed Democratic Party. 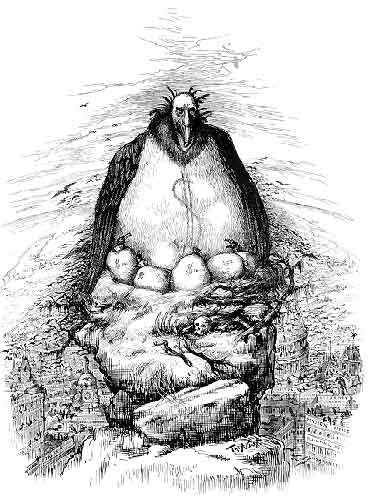 The corruption spread to rapidly growing urban centers across the country, as he suggests in an 1886 image from Harper's: Our System of Feathering Nests Breeds Tweeds All Over the Land. It appeared (correctly) to Nast that pragmatism and not the elimination of social injustice and inequity had become the least venal of the forces motivating political parties, politicians and public policy. Nast officially left Harper's Weekly in 1888, in the wake of the Chicago Haymarket Riot. His work would continue to appear in a number of smaller journals, but never again with the large audience his affiliation with Harper's had engendered. 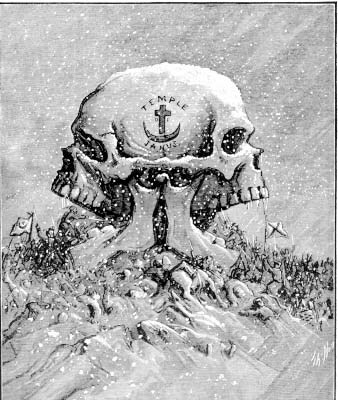 A book of his much loved Christmas illustrations for Harper's was issued, but one planned for his political drawings was never published. From 1892 to 1893, he became involved in a short lived, financially unsuccessful journal of his own, Nast's Weekly. Nast was appointed Consul to Equador by Theodore Roosevelt in March of 1902. He took up the post in July of that year, and it was in Guayaquil that he died, the following November.